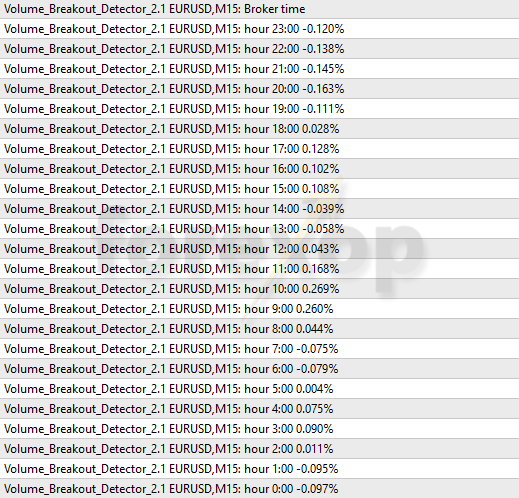 The following release notes are for the Metatrader MT4 Volume Breakout Indicator. Place the indicator onto a chart. If you want to monitor a specific time each day, enter this time into the first box. This should be set in your broker’s time zone, that is the time zone in which you receive quotes (e.g. GMT+2). Otherwise, set the second input “Estimate event time from volume analysis” to true. The indicator will then analyze the chart history and determine for you when the peak daily volume is occurring. The time point will be displayed at the bottom right corner of the chart, and the indicator will use this time value to predict breakouts. See the figure below for an example on EURUSD M30. Line 2 and 3 are the buy/sell flags. These will be set whenever a buy or sell event is detected and set to no values (empty) otherwise. Estimate event time from peak volume analysis Estimate daily time point automatically? The above settings are defaults only and are not a recommendation for any particular strategy. You will need to tune the settings according to the chart timeframe and the market which you are monitoring. In particular, the momentum settings will need to be scaled according to the chart timeframe and per your broker’s point size. Daily events are better monitored at lower timeframes. Also note that for timeframes above hourly (e.g. H4) the event may occur within a bar which would lead to unreliable output. 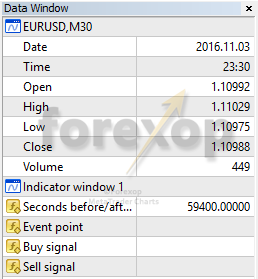 The Metatrader settings box is shown below. Why does the indicator output a counter as well as a flag for the event? The “bar time” of quotes from your broker may not always occur exactly at the clock times of these intervals, for example every 5 minutes or 15 minutes. This means the counter can show one or two seconds delay or advance at the event time. The event flag is set to zero exactly at the event time. Where is the volume displayed? 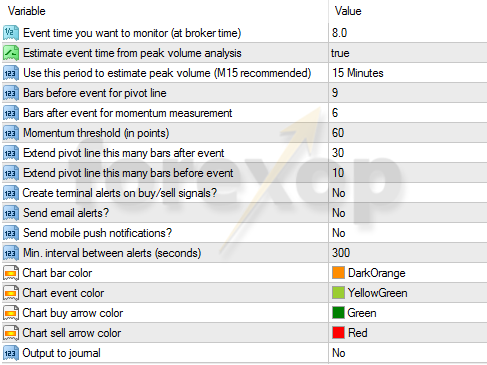 Estimates for the hourly trading volumes are displayed in the Journal and on the chart. To display numerical volume estimates you first need to set the “Journal Output” to Yes. Then set “Estimate event time from peak volume analysis” to true. The volume/volatility at each given hour is shown as a percentage above or below average. The higher the number, the high the volume/volatility is expected to be. Remember that the times shown are relative to your broker’s feed. So for example if your broker is 2 hours ahead of UTC/GMT and peak volume is at 10.00 hours, this means 8.00 GMT. What are the best timeframes to use? The indicator measures activity around the event time (usually daily peak volume). For this reason lower time frames are recommended. For example, 5 minutes, or 15 minute charts are the most suitable. It isn’t recommended to use timeframes above 1 hour because the event times may occur “within the candle”. How much history is needed to estimate volumes? At least 1 years’ worth of chart data is needed. If the price history is less than 2 years, a warning is displayed. The indicator uses the history from the point in time it is loaded. If used in the tester remember there needs to be some history available at the time the indicator loads. You can set the event time manually. This is the default setting for the indicator. For further information please see the product page and the articles on the website which describe several breakout strategies.